Time for Jungle January again. This time, I decided to make something for myself instead of the dolls. I found this snake print rayon Challis in the spot the bolt clearance pile. This is the same snake print I rayon I passed up on early. I figured it would work well for McCall’s 5884 which I made previously in July 2014. So if you want more details on this patter please check out the link at the bottom. This time I went with version D (long-sleeved version) which should work well for spring and autumn. So this time, I added 2 inches to the bottom. I found I liked to tuck and fluff my pink version so the extra length should help out. Then I raised the neckline at least an inch and a half. For the long-sleeved version (view D), I did make the finish cuff length of 9 inches. I don’t think there are separate cuff pieces for view C and view D or I lost the piece. But the cuff piece was 12 inches long and was falling off of my hand when I used the recommended side seams at five-eighths of an inch. It was very windy but up near 60 degrees Fahrenheit for January. The wind just didn’t make for good pictures. The bishop sleeves were fluttering all over. 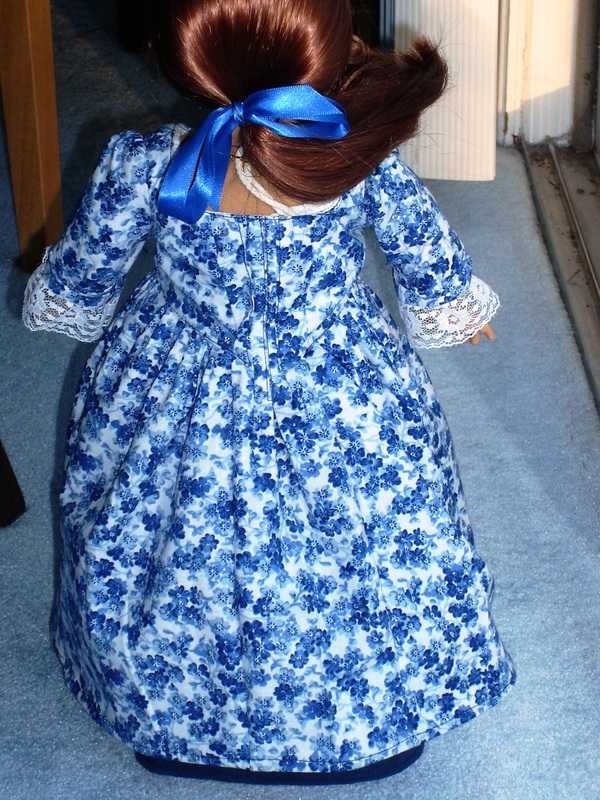 I decided to actually make one of my dolls a new outfit. Several of the past items I made went to my dad’s work’s toy drive to brighten a little girl’s holidays. Alright, I will admit before Thanksgiving I did make myself the Piccadilly outfit (top and skirt). 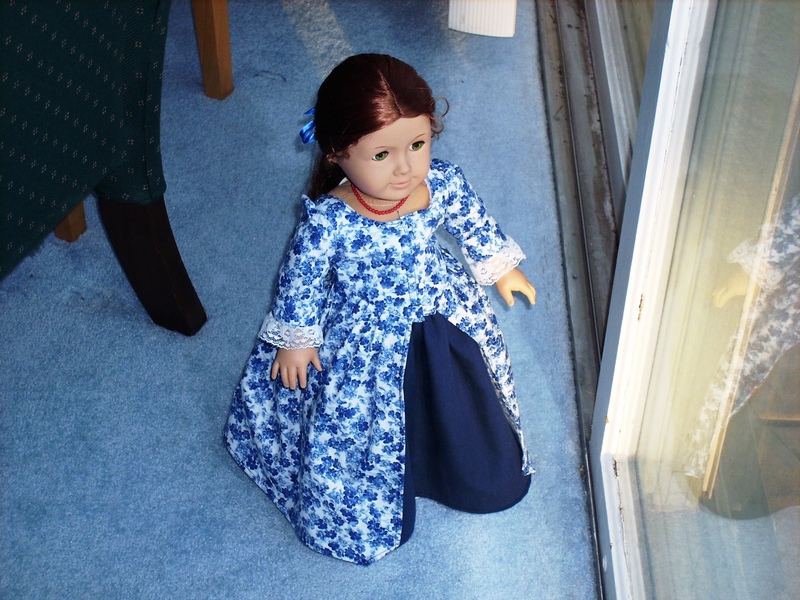 But realistically, I haven’t made as many items for my dolls as I have for my dad’s work. With eight dolls, one needs to decide who get the new outfit. This time I decided on Felicity. She is really the only doll (besides Rebecca but she can share with Samantha) that doesn’t have a hand-made outfit. This is the first time I have used a Thimbles and Acorns pattern. This pattern is rated at intermediate skill level. I would say that rating is absolutely correct. The instructions are very well written. 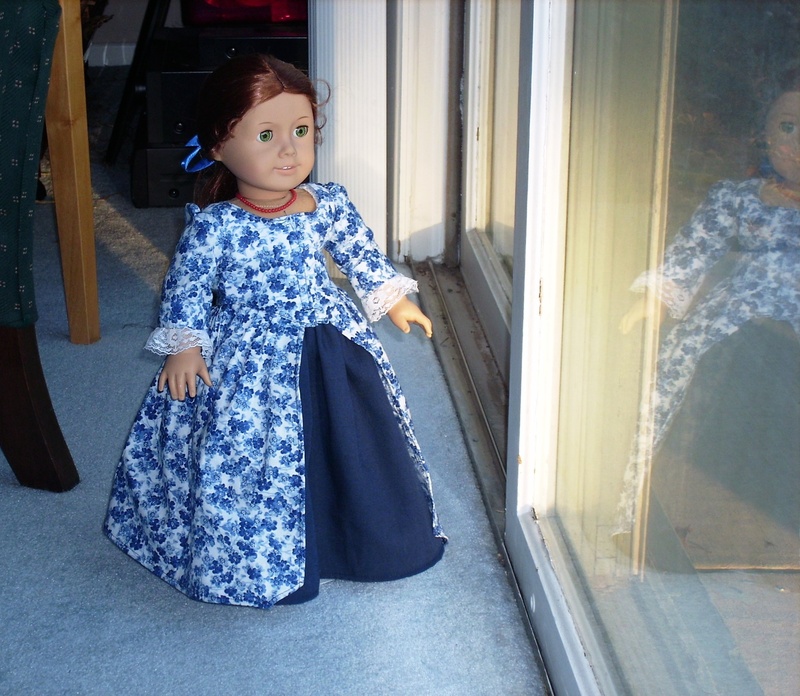 I did have a little bit of confusion when it came to the En Forreau back of the gown and the pleats. There are three pleats on the back. One in the center and one on either side. 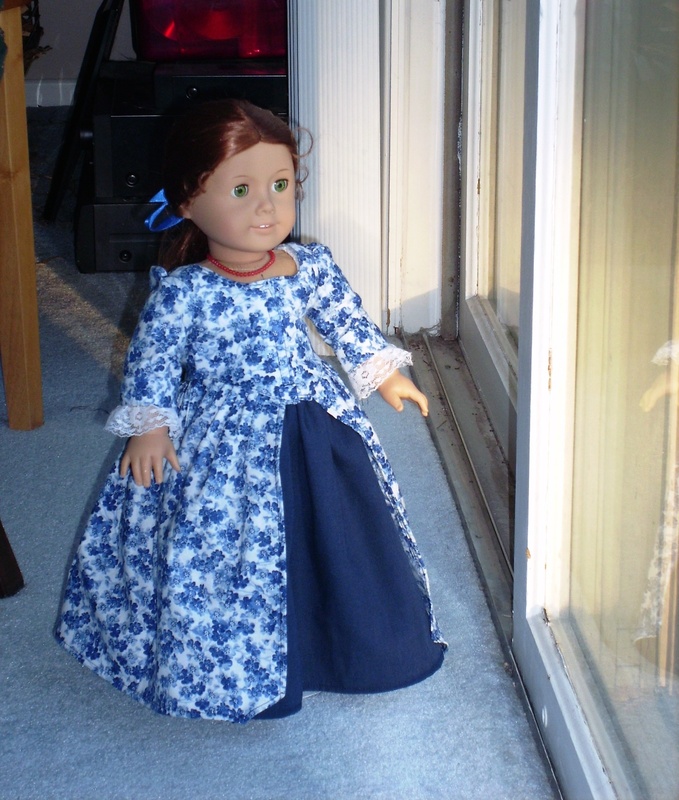 As I haven’t used this company’s patterns before, I wasn’t certain of the best alterations to get it to fit my Felicity doll (remember she is from around 1993 to 1995 so she is chubbier than current dolls). The pattern did state that most body size variations can be accounted for with adjusting the closure or minor modifications. Therefore, I didn’t make any changes to the pattern. As I was making it, I was thinking it was going to be too tight to put on my doll. The fit of this was much better than I thought it would be. Actually if Felicity didn’t have her shift on, I think the fit would be fine. It is tight but not so tight that I wouldn’t be able to get it on my doll. I used Velcro instead of snaps for the front closure. The petticoat was very quick and easy to put together. I think the next time I would prefer to use Velcro for the closure instead of ribbon. I did use a fairly thin ribbon so that may be why I just don’t feel the skirt has the support it needs. I haven’t really worked on Butterick 6108 or Colette Pattern’s Lady Grey jacket. 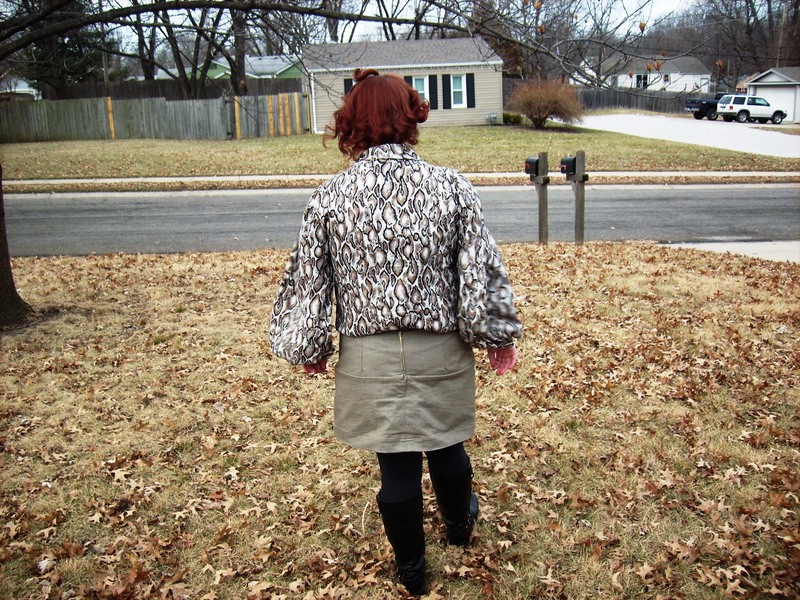 Without finished garment measurements on the pattern, Lady Grey was sort of scary to trace out around Thanksgiving. So instead of working on the two together, I will need to do each separately. I think I will start with Butterick 6018 since the pattern is rated as easy. Right now, I am trying to finish up my Jungle January piece.